Réjean St. Jules was born July 6, 1959 in Montreal, Canada, a second-generation circus performer. His Father, Maurice St. Jules, was a hand-balancer, and his mother, Françoise, a tap dancer. They had met in a variety show in Montreal, fell in love, and married one year later. They also started working together; while they were appearing in a major nightclub in Montreal with an all-European cast, the manager thought their name sounded too French (the language of the Province of Québec), and suggested that Maurice take a more American-sounding name. He thus become Lou Robertson… and Maurice and Françoise became known thereafter as The Robertsons. Réjean was trained in hand balancing by his father, but in 1967, during an engagement with the Garden Bros. Circus in Canada, he met the talented and highly skilled French juggler Sampion Zurani, who began to teach him juggling. (Zurani has worked extensively in the United States and Canada, and had appeared in Carol Reed’s 1956 film, Trapeze). The Robertsons and Sampion Zurani spent two seasons together; it was a long time, and Réjean was able to train regularly and to become quite a proficient juggler. In time, he was comfortable juggling five clubs and eight rings. As Reggie Robertson, Réjean made his debut as a juggler in 1972, at age thirteen, in a show that his father and Zurani had produced together in Prince Edward Island in eastern Canada. The following year, Réjean also debuted the chair-balancing act that his father had built for him; he would perform it for five years, before reverting to juggling only in 1978, and starting a solo career apart from his family. When Princess Grace of Monaco died in October 1982, the International Circus Festival of Monte Carlo was cancelled, and several American top-tier acts suddenly found themselves without the winter engagement they had planned. The Canadian impresario Sergei Sachwyn jumped on the opportunity, and produced a “circus festival” in Montreal, for which Réjean was contracted—along with the famous Flying Cavarettas, whose remarkable star flyerAn acrobat that is propelled in the air, either in a flying act, or in an acrobatic act (i.e. teeterboard)., Terry Cavaretta, was then the only woman to catch consistently a triple somersault on the flying trapezeAerial act in which an acrobat is propelled from a trapeze to a catcher, or to another trapeze. (See also: Short-distance Flying Trapeze). Terry Cavaretta was also beautiful, and she and Réjean fell in love. It is Terry who suggested that Réjean abandon his family’s stage name (Robertson) for his real name, St. Jules, which she thought sounded beautiful. Réjean complied, and for then on, he would be known as Réjean St. Jules. Terry was based in Las Vegas, where she was a star attraction(Russian) A circus act that can occupy up to the entire second half of a circus performance. at Circus Circus Hotel and Casino. Réjean followed her there, and they were married in 1983. That same year, Réjean was featured in the Follies Bergère show at the Tropicana Hotel—the first of a long string of shows in which he would appear in Las Vegas over the next three decades. 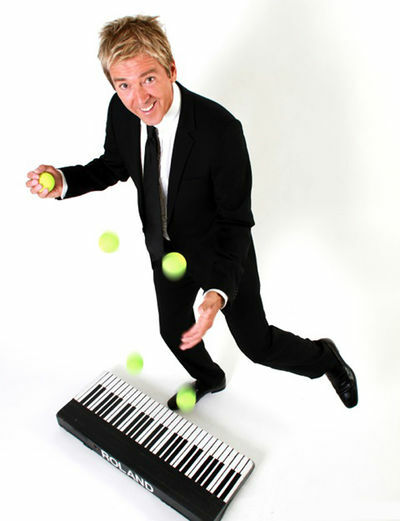 In 1993, he added a spectacular novelty to his act: juggling in rebound on three surfaces positioned in a vertical triangle; the following year, he introduced a keyboard on which he played a tune with his bouncing balls. These would define his act for the years to come, and it definitely set it apart from other juggling acts. His international career took off at the same time, with engagements at Cirkus Scott in Sweden, and an invitation to the International Circus Festival of Monte Carlo the following year. Hence Réjean would share his time between Europe and Las Vegas. In Europe, he appeared in Folie Russe at the Loews Hotel Monte Carlo; the Apollo Varieté in Dusseldorf, Germany; the Lido of Paris; Da Capo Varieté in Darmstadt, Germany; Kerstcircus Ahoy in Holland; and Circus Kronebau in Munich, among other venues. He was also featured in several television shows in North America and Europe, amongst which Patrick Sébastien’s Le plus grand cabaret du monde, France’s (and Europe’s) most popular television variety show. On June 24, 2001, Terry gave birth to Réjean’s son, Sebastian. In time, in the same way as he had been trained by his father in the latter's own specialty, Réjean would teach juggling to Sebastian—who would quickly show a great talent for the craft. Sebastian St. Jules made his debut as a solo juggler in Las Vegas in 2014, at age thirteen, in an act that included his father’s trademarks: triangle and keyboard. Eventually, they developed a spectacular double act in which father and son juggle side by side, in unison. They have performed this act in various venues, including in France on the television show La France a un incroyable talent, where they reached the semi-finals.